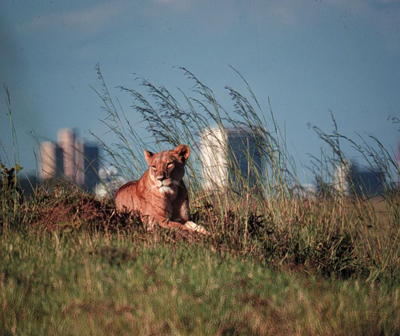 Kenya’s once-wildlife-rich rangelands are under threat: A lioness sits in Nairobi National Park; the Nairobi city centre skyline is behind her (photo credit: ILRI/Dave Elsworth). ‘There have been disturbing declines in wildlife populations in Kenya in the past three decades, a study released this week revealed. ‘”Human population growth, increasing livestock numbers, declining rainfall and a striking rise in temperatures are to blame for the decline,” Dr. Joseph Ogutu, a researcher and lecturer at Germany’s University of Hohenheim that led the study, told Xinhua in an email interview. and increase in livestock numbers. and far-sighted changes to the current conservation and management. equivalent to 1.7 percent loss per year,’ Ogutu said. ‘. . . The researcher suggests that to help restore the situation, some pastoral lands retaining wildlife should be buffered against human activities. ‘The study calls . . . effective implementation of land-use policies and legislations that aim to minimize human-wildlife conflict, habitat degradation, fences, cultivation and annexation of water resources in the rangelands. . ..
Read the whole article at Xinhua/New China: Study shows ‘extreme declines’ in wildlife population in Kenya, 6 Oct 2016. Tags: Joe Ogutu, Xinhua/New China. Bookmark the permalink.